IN THE MEANTIME, every shopper in Kulkucan wandered by – British, Canadian, French, Spanish, American (a Cheesehead, judging by his green-and-yellow hat). Going after that to the decidedly downscale Market 23 was a delight, peering through huge buckets of pottery, woven baskets, voodoo [sic]. 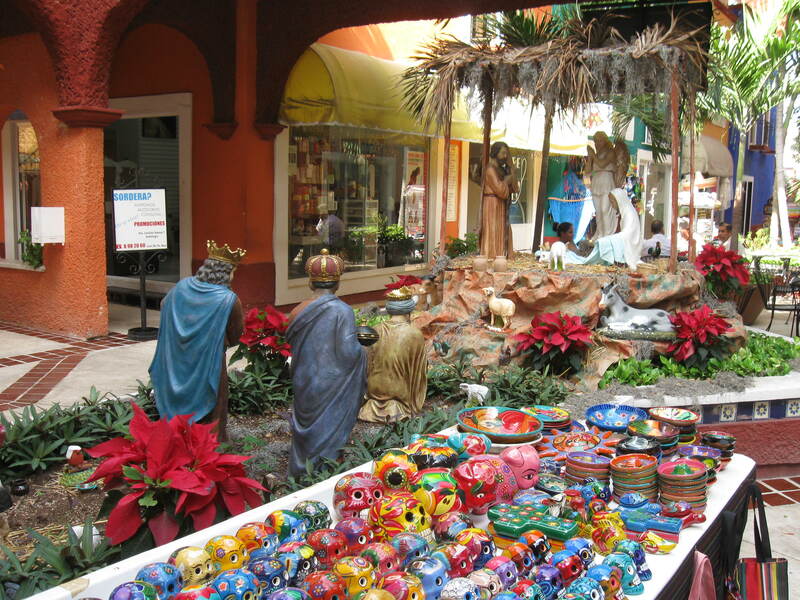 It was the first market in Cancun – there are now over 20 supermarkets in Cancun. 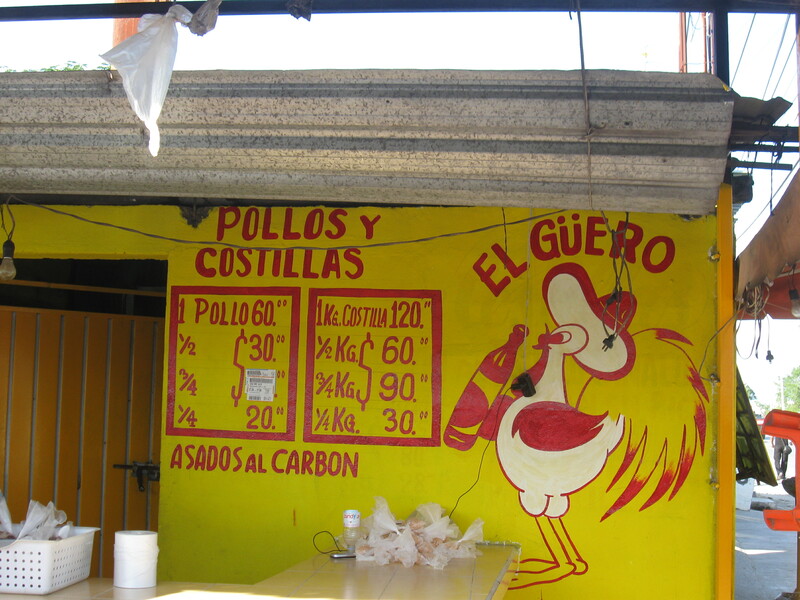 We sat down for lunch – the only Anglos – and between us managed to consume several soups, salads, and a chicken taco smothered in lime juice. 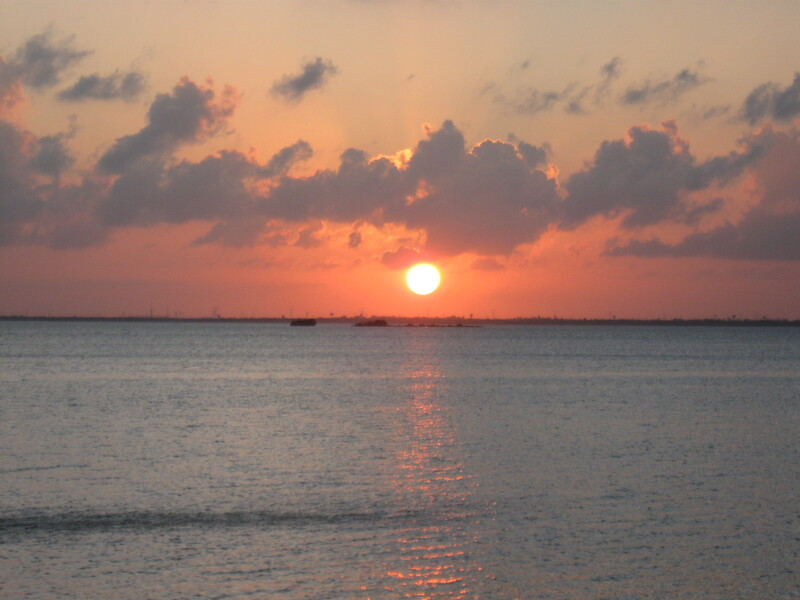 I have not swum with the dolphins and doubt I will, as we head home tomorrow, but today – which began with this 6 a.m. sunrise – was one for the books. 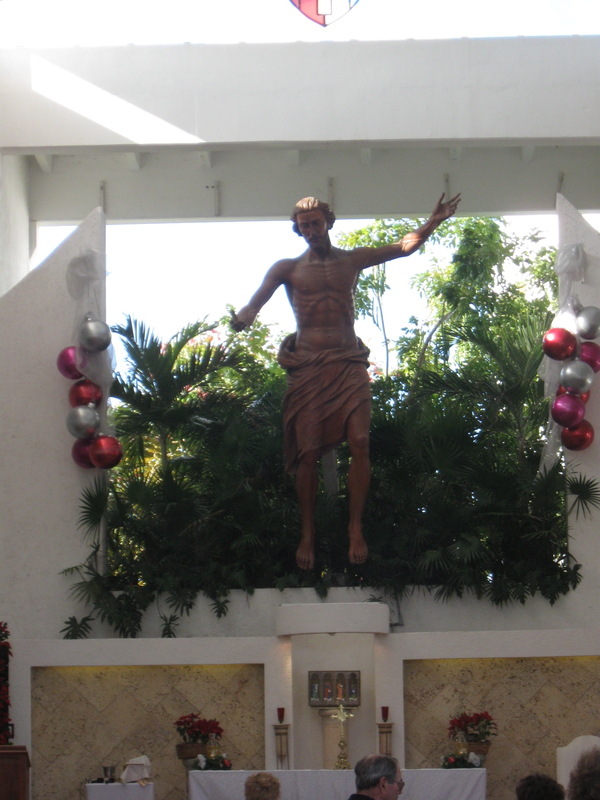 ITINERARY: Mass, Isla Mujeres, a drive through a barrio Peggy knows well. Her mantra (cf, above) should have been my first clue, but I am still so fascinated by the colors – houses, ceramics, sky, water – that I never thought twice about navigation skills. Mass at Cristo Resucitado, in Spanish, possibly Greek, but with George Clooney (or his double) distributing Communion, the language barrier ceased being a problem. 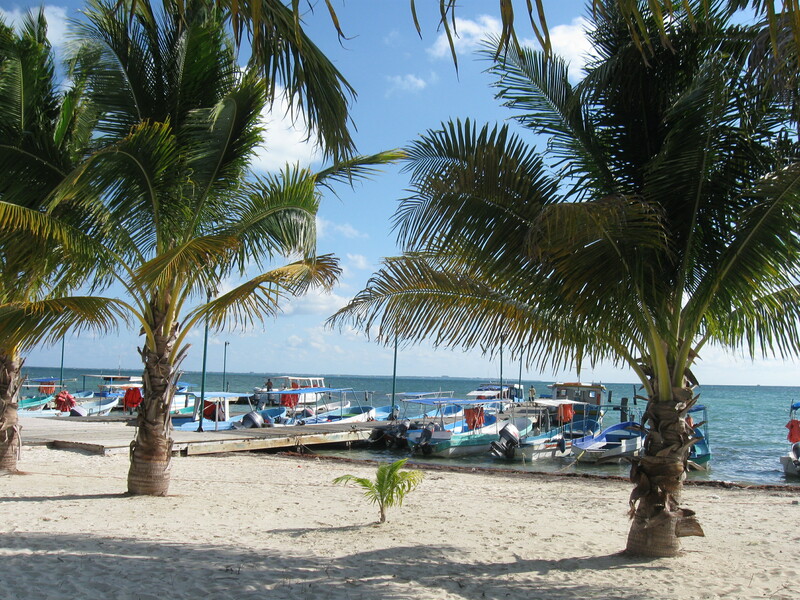 We waited for the ferry at Puerto Juarez. 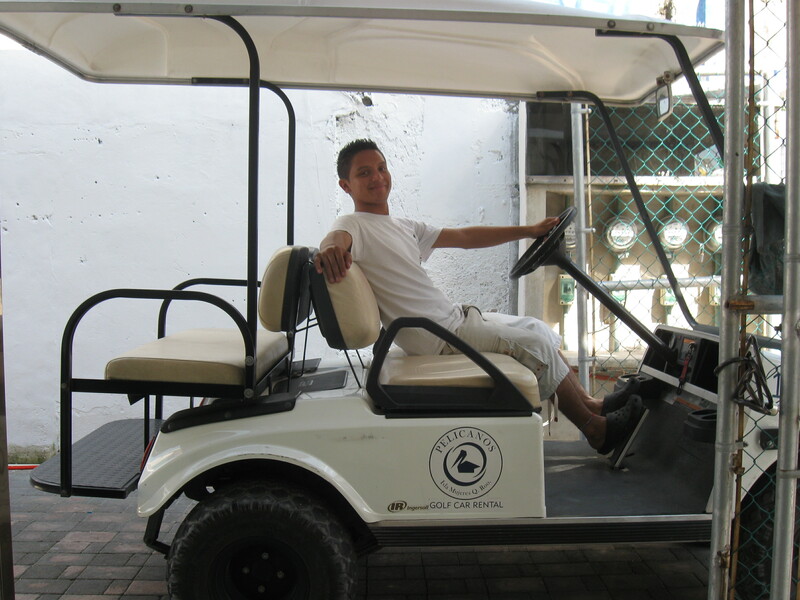 Pedro, demonstrating how to work Isla Mujeres' ubiquitous golf cart. We used it all afternoon. Fortunately, the island has a "Peripheral Route" so all we needed to do was circle the island. Returning the golf cart at the end of the day was a challenge, as the One-Way sign was usually hidden by palms or hawkers or our general inattention to detail. However, we rarely went more than 100' before noticing all the traffic was...ONCOMING. 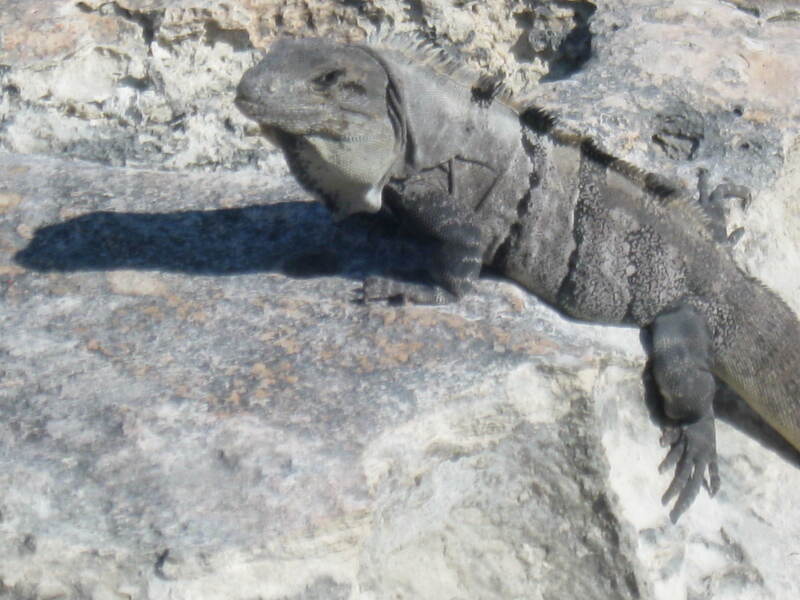 Several "Iguana Crossing" signs on Isla Mujeres, but most of the creatures,like this fellow, wisely kept their distance from our golf cart. We watched the tourist ferries drop some Asians and quite a few Americans, then boarded our own humble craft for the ride back. Peggy assured me that the captains (every one had “CAPTAIN” inscribed on his cap) were all trained for International Waters. Her fascination with people who are well trained in navigating should have given me pause. 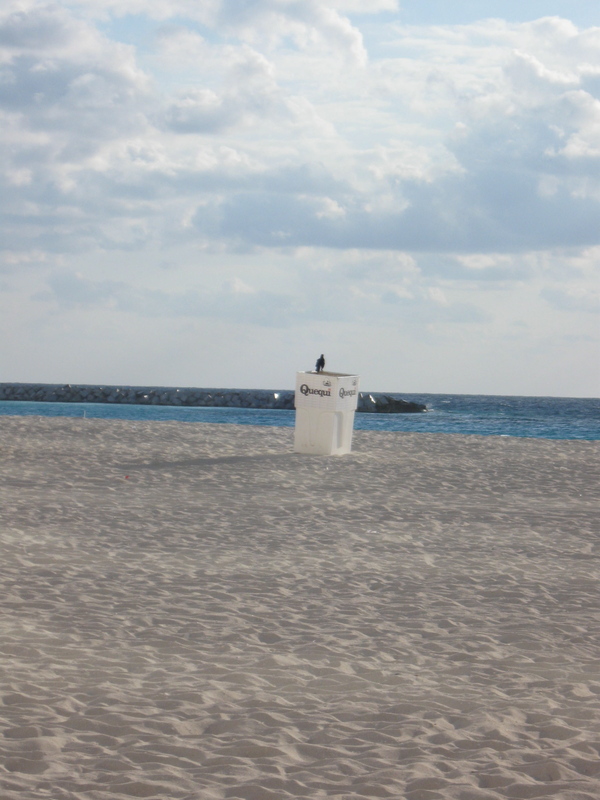 Once back on land – Cancun – we began our drive to see the apartment Peggy had often rented, years ago. I became, as she pointed out, a co-conspirator: if we needed to get to the other side of the road, I always found a crossroad and encouraged her to ignore the “no turn” sign. I am not proud, but I know I saved time, and we visited the apartment and the apartment owner; while the two of them reminisced, I listened unsuccessfully for phrases that would give me a clue about their conversation. Then we set out for the street food vendor Peggy loves. 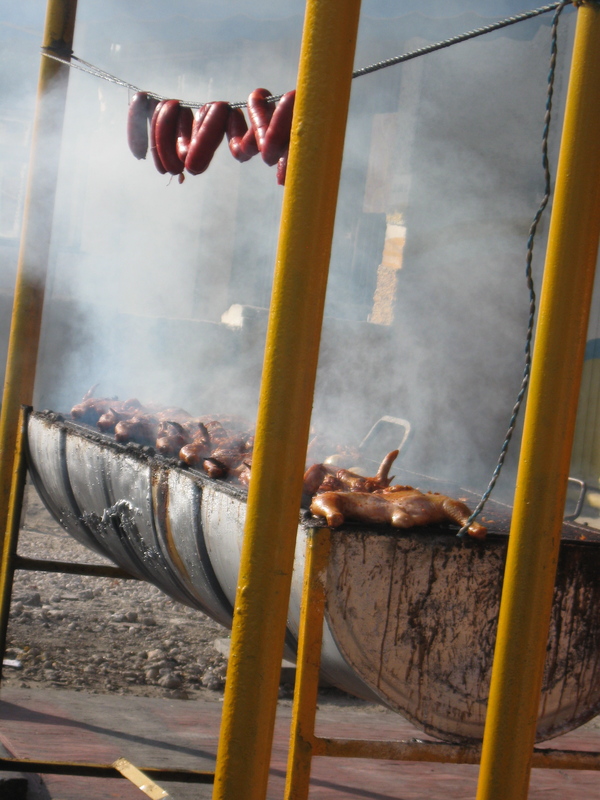 We polished off several pieces of the best pork in the world as we drove. 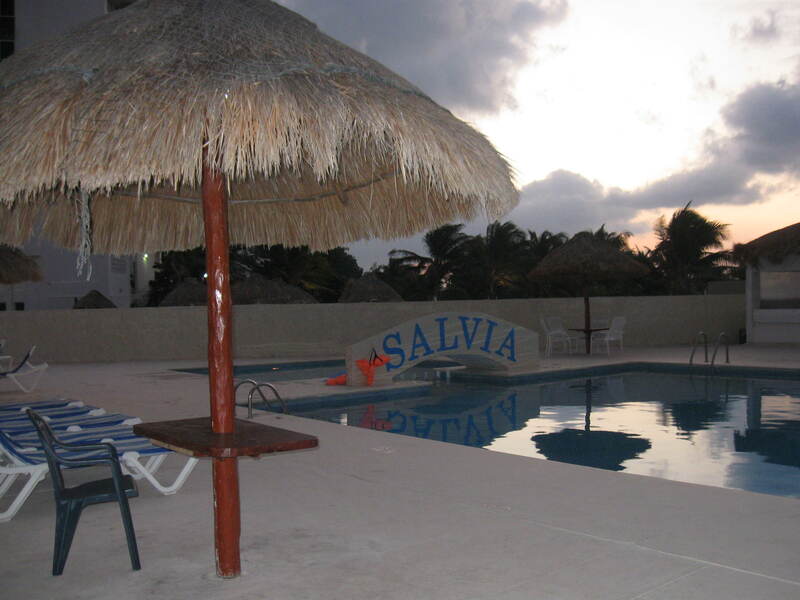 We saw houses and people that were a lot different from the ones in our area of Cancun, or on most of Isla Mujeres; eventually, I thought to ask Peg if she had any idea how to get back to the Salvia, her condominium complex. Never mind that she began her answer by assuring me that she had never run out of gas while trying to get anywhere — I really didn’t mind: the Jeep is fun, the people around us, fascinating. Then I heard, “Uh-oh,” and felt her pulling out of traffic, and off to the side of the road. The oil dial had dropped below Zero, the Jeep had died. ME: “If you keep an eye on traffic, I’ll get out and look at…” I had no idea what to look at, or where. 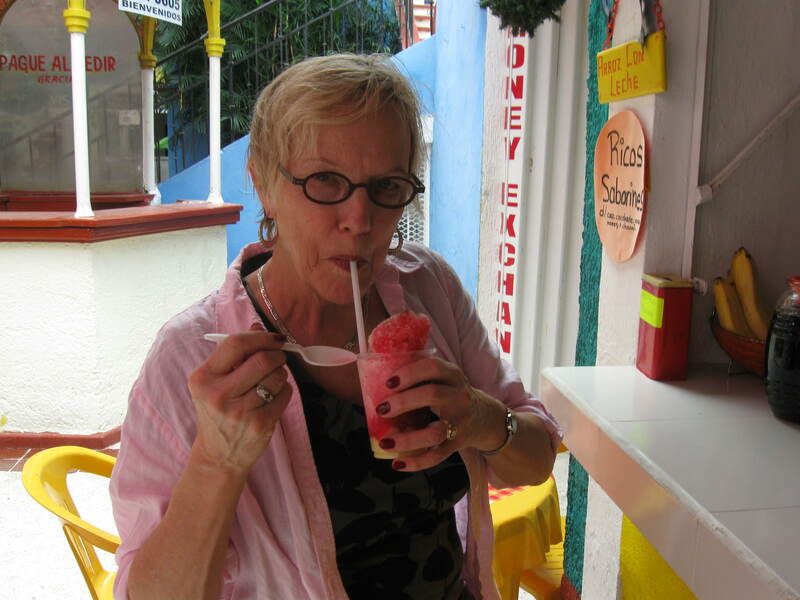 I chose not to ask if she had ever taken a bus in Mexico, and instead suggested she try the ignition one more time. And, of course, the Jeep started easily, and we were home in time to watch the sunset. 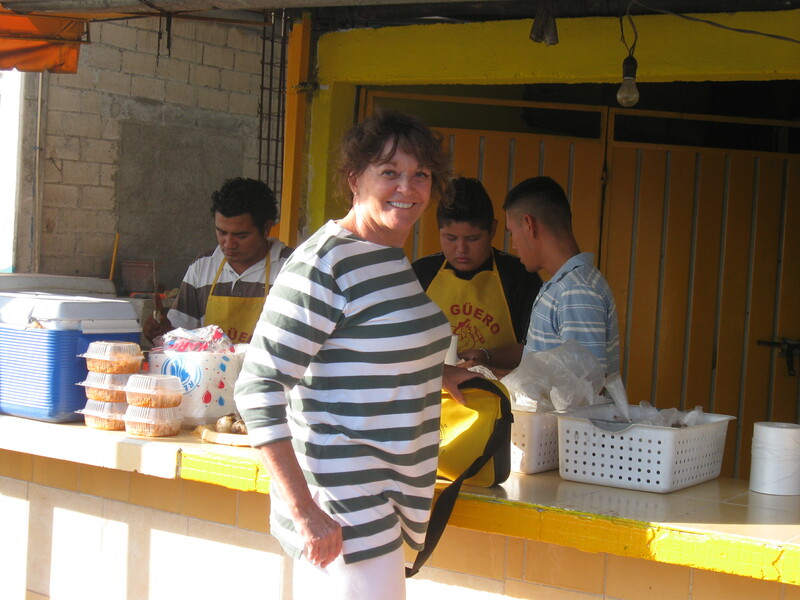 I really hope the Immigration Service does not check the form I dashed off as the plane set down, b/c I had NO idea what to write for “your address while in Mexico.” I knew only that my friend Peggy would be there with her Jeep, as I exited the airport. I thumbed through Lonely Planet, or tried to, but couldn’t get the Nook to get there soon enough, so I ended up with “Tulum” and wrote in the name of the first hotel (a hostel, actually) I saw. I exited the airport, passed the hawkers of taxis and limousines and time shares…and there she was, with her open-air wonder. 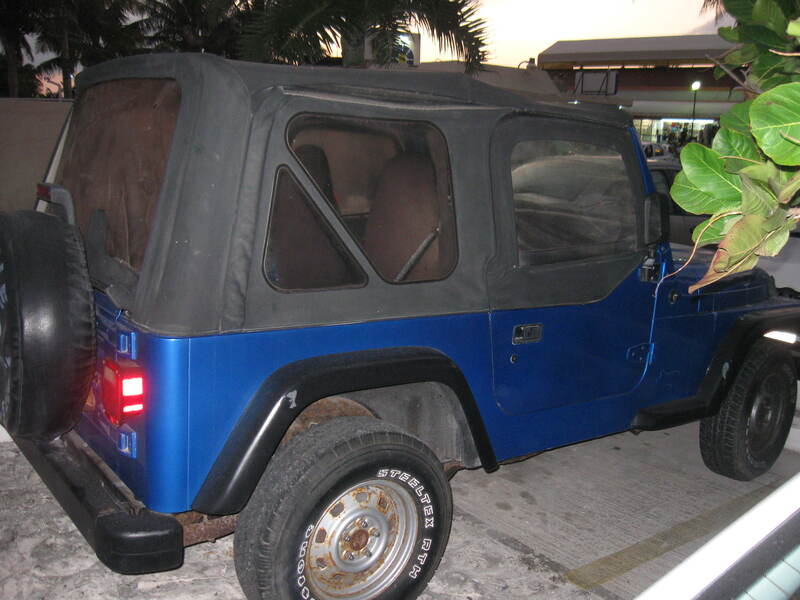 Peggy's Jeep, windows inserted for the evening. Undoubtedly I am not the first person to have practiced meditation on these white sands, not the first one to have said, “Breathe with the waves…” but I’ll say this: I really was the only person as far as the eye could see across our stretch of the beach. Mercado 28 Barbershop. 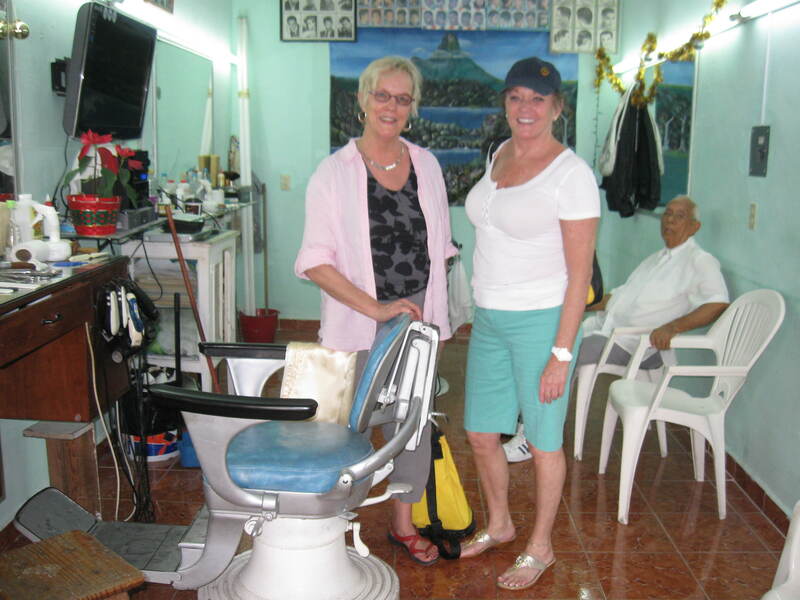 Peggy - my 5 children know her as Master Barber & Master Barber Teacher, as well as Mom's friend - is saying, "Do you have any idea how many times I've had my picture taken in this place (JUST SMILE)?" Amazing Crema Gloria VeraCruz. How do you say Sugar High?